If you want to know, the man, Mr. Litos has the CAA brackets here. Click here for "Part II of Three Games in 24 Hours - An Empty City For a Half." "Holy sh**! TIE-GAME--Mason fouls on last second half court shot attempt by NE. NE make free throws for the win!" I had to see this myself, so I went on and watched the latter part of the second half of the game. And sure enough here's how it worked out. Mason was up 48-45 when Matt Janning hit a three to tie the game at 48 with 25 seconds left. The Patriots then called timeout. Off the timeout, Mason worked the ball to Luke Hancock (?) and he missed the driving layup. Mike Morrison appeared to be fouled when he tried the follow dunk, but no call. Then the Huskies Chaisson Allen grabbed the rebound and tried a 40 foot shot off one leg at the buzzer, which missed. But sure enough, there was the foul call on George Mason's Ryan Pearson..by the ref at the far end of the Huskies basket. I had to say something about this on my Twitter account, which is gmoore21566 for you fans of the College Hardwood. I tweeted "I'm sorry but ref has to eat whistle there on 'the foul' on Pearson after prior no call." And that's exactly right. The announcers for the game Jon Sciambi and LaPhonso Ellis said the same thing. The game should have been allowed to go into overtime. For the second time this weekend, we have inconsistent (perhaps incompetent) officiating affecting/deciding the outcome of a game, instead of letting players decide the outcome on the floor. No wonder Jim Larranaga after the game was over was "talking" to the officials and was the last on the handshake line. And not only did this decide the game, this decided the third seed of the CAA Tournament. Combined with the Mason loss, and their win over UNCW, William and Mary became the third seed of the tournament. Mason became the fourth seed and gets the worse potential quarterfinal draw with fifth seed VCU, basically the home team for the Tournament. It was off to the Mack Center to see the Hofstra- Georgia State game with nearly 4,000 of my closest friends. So as some of those fans that I know and I discussed the Mason - Northeastern game at our seats, the Hofstra Senior Day festivities occurred on the court prior to the game. Seniors Cornelius Vines and Miklos Szabo were honored for their two years of playing at Hofstra (both were JUCO transfers). Vines in particular was very emotional accepting his award with his mom and grandmother in attendance. And Vines would play a very important part in this game today along with a crazed but funny fan in the Hofstra student section in the second half. The first fourteen and half minutes were very competitive. Vines hit two threes to put Hofstra out to a 6-2 lead but Georgia State would come back. The Panthers twice had leads of five points including 19-14 on a layup by Xavier Hansboro with eleven and a half minutes left. The Pride would come back with two threes by Vines and then take a 23-22 lead on a Charles Jenkins three with 8:14 left. It was a lead the Pride would never relinquish. GSU's James Vincent hit a layup to cut the lead to 26-25 with 5:57 left. But Hofstra would respond with a 17-4 run over a four minute span to go up 43-29 with 1:54 left. Halil Kanacevic and Charles Jenkins combined for twelve points during that span. However, Georgia State would score the last seven points in the half, five by Joe Dukes to cut the lead to 43-36. Dukes kept the Panthers in the game with 13 points in the first half. Meanwhile, Jenkins (14), Vines (15) and Kanacevic (10) combined for 39 of the Pride's 43 points. Vines was 5 of 10 from beyond the arc. The Pride also had a strange statistic in the first half - 1o assists and 10 turnovers. The second half started out with Georgia State rallying, cutting the lead twice to two, the second of which was 49-47 on a layup by Dukes with about 16 minutes left. Hofstra would start stretching out the lead but another Dukes layup made the score 53-49. It would turn out to be the Panthers last stand. Then a rabid member of the Lions Den, the Hofstra Student Section, standing in the first row behind the basket decided to take matters into his own hands and the rest of the Lions Den joined in. During every Georgia State free throw attempt, the student would strip down to his speedo underwear and do a very suggestive striptease dance while the student section loudly chanted "LOOK AT HIM!" To paraphrase my tweet from yesterday while it was happening, it was insane and it was working. The guy should be hired by Chippendales. With his Panthers down 55-49, Dukes missed his two free throw attempts. Then Trey Hampton would miss two of his four free throw attempts. Then Dukes again missed both his free throw attempts. And Ousman Krubally missed his one and one free throw attempt. Meanwhile Hofstra went on a 11-2 spurt and the game was over right there. The damage done by the student I called the "Look at Him Fan" - the Panthers were 2 of 9 from the line while Hofstra scored eleven points. I tweeted Jerry Beach and asked "Can we bring the 'Look at Him Fan' to Richmond?" Kudos to a very creative, albeit absolutely nuts fan and even more props to a terrific Lions Den for joining in with that creative loud chant. That's what I think a student section should be, loud and creative. As I overheard a couple of fans discussing it afterwards, the Look at Him Fan was like a train wreck you couldn't turn away from. And apparently the Georgia State players couldn't either. Hilarious! From there, the Pride took control. The lead grew to eighteen, 82-64 on a layup by Kanacevic with 3:09 left. Now I want you to look at the picture on the left. As Tieff pointed out to me, all five Hofstra players on the court late in the game had seven rebounds. How often do you see that? Sevens Are Wild! Back to the game, Vines left to a standing ovation and he in kind returned the love by pointing to each part of the stands. His replacement, walk-on Matt Grogan got into the scoresheet by drilling a long three to make the score 86-71. The final score was 87-74 Pride on Senior Day. Jenkins had another terrific game with 29 points on 6 of 10 shooting from beyond the arc. Vines had 18 points on his five first half three pointers. Kanacevic added 16 points and Chaz Williams had 10 assists. Hofstra was 12 of 27 from beyond the arc and 21 of 28 from the line. Dukes led the Panthers with 22 points and Hansboro added 11 points. With the win, Hofstra (18-13, 10-8 CAA) completed an unreal turnaround in the CAA. The Pride were 2-7 at the halfway point and went 8-1 in the second half of the season. Including their Bracketbuster win over Rider, Hofstra won nine of their last ten games and knocked Northeastern out of first place in the CAA the last week of the season. This might be Coach Tom Pecora's best job ever. The reward for the Pride. Well after all the machinations involving Towson, UNCW and James Madison played out, Hofstra gets to play...Georgia State again in the first round of the CAA Tournament. And if Hofstra defeats Georgia State, they get to play..Northeastern again in the quarterfinal round of the tournament. Win both those games and Hofstra is in the semifinals with 20 wins on the season. Only in the wild and wacky CAA can you get that to happen. Now if Hofstra can only get the Look at Him Fan down to Richmond. 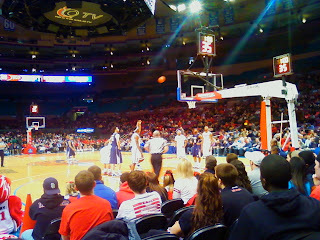 Thanks to my friend Mal, I had two free courtside seats to yesterday's noon game at MSG as Pittsburgh took on St John's. Originally Tieff was going with me, but he had garage renovation issues. Mal was unavailable as well. So, I asked my four year old son Matthew to go. 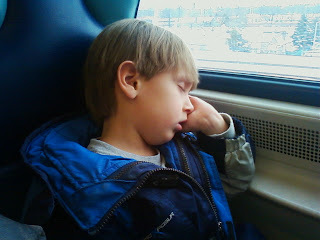 I don't think he was interested in the basketball game as much as the train ride into the city (I was right on that). So after giving assurances to my wife that he would be just fine, Matthew and I embarked on a very familiar trip to me. Matthew soaked in his first LIRR train ride by drawing a train with a conductor and people (always make sure your four year old has a knapsack of paper, drawing material, markers, snacks and his favorite toy). As for me, I have been taking train rides into MSG since I was in college to watch basketball games, Knicks games, concerts etc. And I have seen my share of St John's games here, especially when they were in their glory. I remember sitting up in the 300's with my ex girlfriend Mary watching the Jonnies take on Syracuse in a sold out Garden. I had my binoculars with me watching Mark Jackson dribble at the top of the key on Sherman Douglas at a critical point late in the game. Jackson took his eyes off Douglas for a second and Douglas took the opportunity to steal the ball from Jackson. Cuse went on to win the game. Those days are long gone. In January, I wrote "My Take on Empty City", which was my addendum on Kyle Whelliston's terrific Mid Majority article on "Empty City". In my article, I talked about how St John's has fallen from grace thanks to some bad coaching choices and the mighty Big East passing it by. Yesterday was another example of it. As we sat in my courtside seats as my older son munched on a soft pretzel, I could see directly ahead of me a good chunk of the empty 200 and 300 section seats. How that would not have happened in the Carnesecca days. As for the game itself, coming off a heartbreaking MSG loss to Marquette a few days prior, I could tell the Jonnies were very flat. That is a dangerous combination when you are not a good team as St John's came into the game at 5-9 in the Big East and 15-11 overall. Especially when you are playing a nationally ranked Panthers team that was supposed to be in rebuilding mode and was picked to finish in the bottom half of the Big East. Despite a 7 1/2 hour bus ride, the Panthers were not lethargic and jumped out to a 16-8 lead with nine and half minutes left in the first half. Beleagured Jonnies coach Norm Roberts called timeout, but to no avail. As his team of bricklayers continued to put up bad shots and miss free throws, the Pitt lead swelled to 26-14. Pitt would end up shooting 50 percent from the field in the first half. And the St John's fans behind me voiced their displeasure, which is now seemingly in its eighth straight year since they last made the NCAA Tournament (first round loss to Wisconsin in 2002). How bad was St John's playing? At one time in the first half, the Jonnies were shooting 22 percent from the field (overall 33 percent in the first half) and only 53 percent overall from the line for the half (7 of 13). It was during this time that my son Matthew voiced his displeasure about the noise in the Garden. You see, he had tubes inserted into his ears last month to relieve a fluid problem, which resulted in his hard of hearing. Now he hears really well and he is not used to loud noises, such as PA systems and the such. Matthew wanted to go back on the train and home to Bellmore and mommy. And well I had been planning to leave the game a little early anyway to make sure to catch game number three of my 24 hours of college basketball, Georgia State vs. Hofstra. As I consoled Matthew by having him curl up into me, it was during this time I noticed the rest of our entire row. The two of us were sitting on the end of the row by ourselves. So I had to take this picture with my cell phone camera (since my canon camera batteries died). 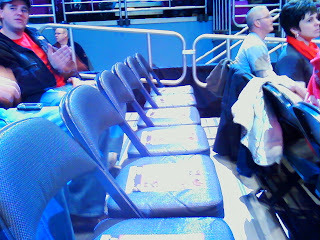 Now it so happens that a couple showed up to their seats in the row a few minutes later. But the vision of the empty row, along with the scoreboard and the overall lack of enthusiasm in the crowd of 6,859 (which is a little more than a third of MSG's capacity) mentally reinforced what Kyle and I both wrote about back in January. When Pittsburgh called timeout with 15 seconds left in the half leading 31-23, that was our cue to leave. We walked up to the stairs to the exit and I stopped to put Matthew's jacket on him. I then looked back at the court and the arena in general. It's amazing what can happen in the span of eight years. A once filled arena now at barely over a third capacity. It made you wonder is it really this bad. Pittsburgh would go on to beat St John's 71-64. Then when we stopped in the bathroom because nature was calling for me, I just listened in on all the disgust of the St John's fans. How Anthony Mason Jr. couldn't hold a candle to his dad. How bad a coach Norm Roberts was. How bad the shot selection was. How bad the St John's facilities are compared to other Big East teams. Then I realized, these are the remaining diehards who are trying to be loyal, clinging on for hope and venting because there is no justification for their support. For many others, that hope is long gone and in such a tough economic climate, it's hard to justify spending dollars on a team that has been not very good for a while now. As far as St John's is considered, right now MSG truly is an empty city. As we left the Garden, my older son announced to me "I am not going to any more basketball games with you any day". Guess he really hated the noise. Or maybe it was St John's bad first half. Either way, we caught our 1:16 train back to Hicksville. On the ride back, Matthew fell asleep. I doubt very much that he had visions of fast breaks dancing in his head. As I viewed our snowy landscape courtesy of our latest blizzard, I could only hope that eventually he will enjoy loud college basketball arenas like MSG. The question is will St John's ever fill the Garden again so it can be loud? Right now, the answer is "Not for the forseeable future". And that's a shame. Pride win 87-74. Jenkins has 29. Even walk on Matt Grogan hits a three for Hofstra. Hof finishes 10-8 in conference regular season. Pride up 51-47 with 14:54 left in the game. Hofstra up 43-36 at half. Three players in double figure scoring - Jenkins, Vines, and Kanacevic. Hofstra up 33-27 with 4:10 left first half. Vines with five threes now. It's the CV3 show. Vines with Four threes. Hofstra up 23-22 with 7:59 left in the first half. Georgia St up 19-14 with 11:30 left. Pecora not happy with front court play puts in Washington with two fouls. At the Mack for senior day for GSU-Hofstra. Updates to come. Having successfully shoveled out of the snowstorm and built my son's giant sled hill in the backyard (which he loved), I started the last regular season basketball weekend of 2010. Three games, 24 hours. First it was Iona-Marist women's basketball in New Rochelle on Friday night. Then a noon game at MSG with St John's hosting Pitt. Then finishing off the CAA regular season with Hofstra hosting Georgia State. This was my second time up in Hynes Athletic Center in a week. I was there for Bracketbuster Friday as Iona defeated William and Mary. This time I was here for the return game of the Iona Lady Gaels taking on the defending MAAC champion, the Marist Red Foxes. Marist won the first game up in Poughkeepsie earlier this month, 68-58. Little did I know I was about to see one of the most exciting games of the basketball season. Iona and Marist have a significant recent history. The teams have played each other in each of the past four MAAC Tournaments, twice in the championship game. Each time, Marist has won. And the two teams seem to be on a collision course to play in the championship game again. Going into the game last night, Marist had clinched the regular season championship while Iona had clinched second place. For this second game against Marist, the Lady Gaels were shorthanded as Iona was without one of its three best players. Forward Anda Ivkovic injured an ACL two weeks ago and is out the rest of the season. So for Iona to beat Marist, other players had to step up. The game started off as a harbinger of things to come. Both teams traded leads early and shot the ball very well. The teams traded the lead a combined ten times in the first half with five ties. Iona appeared to have the upper hand, going back up 30-28 on a Samantha Kopp three with 3:56 left in the first half. But then a key second foul on Kristina Ford with 3:31 left in the half changed the momentum of the game. Ford, who was leading Iona with 13 points, went to the bench. Marist responded with a 10-0 run capped by a Lynzee Johnson layup to put the Red Foxes up 38-30 with 1:59 left. Coach Tony Bozzella wisely called timeout and Iona was able to cut the lead to five, 42-37 at the half. Both teams shot very well at the half as Iona shot 52 percent and Marist shot 50 percent. Marist was 6 of 7 from beyond the arc, while Iona was 7 of 12 from three. The difference was Marist was outrebounding Iona, especially on the offensive end. The second half started with Iona hitting the first basket to cut it to three, 42-39. But Marist would extend the lead twice to eight, the second time coming on a jumper by Rachelle Fitz, a name you would hear a lot over the PA system this night, putting the Red Foxes up 51-43 with 15:55 left. But Iona would respond with an 8-0 run to tie the game at 51 on a Ford three pointer with 13:58 left. Then came what I thought was one of the critical turning point periods of the game. And it was provided by two very questionable calls by the same very short female referee. After Fitz again put Marist up two, 53-51, Iona point guard Marisa Flagg drove the lane, went up for a shot, and collided with a Marist player. The referee under the basket with the best view called a blocking foul on Marist. The female referee who was further away from the play came over and brought over the third referee and the call was reversed to a charge on Flagg (she actually reversed the call) This of course incensed the crowd. Ford would eventually tie the game at 53 on a jumper with 12:47 left. But less than 30 seconds later as both teams dove for a loose ball on the floor, the female referee again a somewhat suspect foul on Ford as she fought for the ball on the court. It was Ford's fourth foul and she had to leave the game. As a result Marist went on a 11-3 spurt to put the Red Foxes up 64-56 with 11:03 left. It was during this time with the game possibly slipping away, Bozzella rolled the dice and inserted Ford back into the game. And the Lady Gaels responded with an 11-0 run, capped by, who else, Ford with a layup to put Iona up 65-64 with 4:57 left. The teams would trade leads again with Iona up 67-66 with three minutes left. Then Iona suffered what seemed to be a huge blow to their team when Ford was called for her fifth foul again on a questionable call by you know who and Iona was forced to play without their star sophomore forward. But the Lady Gaels were not deterred and regained the lead on a jumper by Thazina Cook, who had a terrific second half, with 2:23 left to put Iona up 69-68. After Diana Hubbard hit one of two free throws to put Iona up two 70-68, the Gaels would extend the lead to four 72-68 with 53 seconds left. on two free throws by Anna McLean. But Fitz again would respond with a basket, was fouled on the play by Iona's Suzi Fregosi and hit the free throw to cut it to 72-71 with 28 seconds left. Marist immediately fouled Fregosi, who only hit one of two free throws to put Iona up 73-71 with 27 seconds left. And again, Fitz responded with a putback layup off an Erika Allenspach miss, to tie the game at 73 with 18 seconds left. Then came a bad play that could have cost Marist dearly. As Marist coach Brian Giorgis pleaded with his team to break off their press ant not foul, Fitz suffered a brain cramp and fouled Cook with 11 seconds left. Cook sank the two free throws and Iona was back up 75-73. As the home Gaels crowd chanted DE - FENSE, Marist would drive the length of the court and with one second left, Fitz got fouled on a layup attempt by McLean and Fitz hit the first three throw to cut it to one. Bozzella called a timeout to try to ice Fitz before the second free throw. But to no avail, as Fitz hit the second one. We went to overtime tied at 75-75. In overtime, Iona jumped out to the lead on a three by Diana Hubbard. But again, Marist would get an offensive rebound and who else, Fitz scored on a layup and cut the lead to one, 78-77. McLean would put Iona back up three 80-77 before Johnson tied the game at 80 with a three pointer with 2:45 left. Then came the exciting end. Both teams had opportunities to take the lead but couldn't convert. After Cook missed a shot and Allenspach rebounded the miss, Marist called timeout with six seconds left in overtime. Allenspach would then hit a running driver with Cook in her face with 1.8 seconds left. Bozzella called a timeout to attempt a play, but Cook never got off a shot as the clock expired. Marist came away with the 82-80 win, much to the dismay of the home crowd. Fitz, who scored her team's final seven points in regulation led all scorers with 28 points and had 12 rebounds including a devastating seven offensive rebounds. Corielle Yarde added 16 for Marist. Cook who had a monster second half, led Iona with 21 points, while Ford scored 20. Anna McLean, who during the game became only the third Iona player with 1000 or more career points and 850 or more rebounds, added 14 points for the Gaels. The Lady Gaels shot 50 percent from the field for the game while Marist shot 45 percent. There were two major factors that were the difference in the game. Marist was a perfect 7 of 7 from the line while the Gaels were only 13 of 19 from the charity stripe. Even more important was the difference on the boards, as Marist outrebounded Iona 42-3o. And on the offensive glass, Marist outrebounded Iona 17-9. You can't give a team so many second chance opportunities. But after two exciting regular season games, the teams seem destined to play a third time in Albany for the MAAC Championship. As Coach Bozzella walked off the court, he looked up at the scoreboard, smiled and shook his head. He knew how close his team had come to winning the game. To paraphrase the old adage, perhaps the third time will be the charm for Bozzella and the Gaels. With another snowstorm hitting Long Island, it's another day off from work. Even had time after shoveling snow to make a giant hill for my older son's sled. And still had time for the last Mid Major Baker's Dozen before conference tournaments. The tastiest thirteen A-10 free mid major teams in the country. 1) Butler - The Bulldogs have won seventeen straight. Number 17 was won by 17, in a impressive win over Siena. The Bulldogs are a Sweet 16 Team waiting to happen. 2) Gonzaga - The Zags rebounded after a loss at improving to Loyola Marymount by beating up Pepperdine and Santa Clara to clinch their tenth straight regular season WCC title. But the Marymount loss may have mortally wounded their chance to play in Spokane in the first round. 3) Northern Iowa - After a really terrific win over Old Dominion minus Jordan Eglseder, the Panthers suffered a major letdown and lost to last place Valley member Evansville. But with Wichita State imploding, NIU is the team to beat in the Valley Tournament. 4) Cornell - The Big Red rebounded from their loss to Penn by squeaking by Princeton. If the Big Red can win their return dance with the Tigers, the Ivy is basically theirs. A dangerous first round NCAA Tournament opponent. Just ask Kansas. 5) St Mary's - Turns out that the Gaels turned down a Bracketbuster game and now are scrambling to find a team willing to play an extra game on the schedule. Sound familiar? They did that last season too and the win over Eastern Washington didn't work. 6) Utah State - The biggest mover in these standings. The Aggies are on a huge run having won thirteen in a row. They followed up their big home win over Louisiana Tech with a resounding win over Wichita State in their Bracketbuster matchup. And not even a long trip to Hawaii can cool off Utah State as they defeated the Rainbow early this morning. 7) Siena - The Saints had their chance for a signature non conference road win for their at large bid resume when they faced Butler last Saturday. And Siena went out to a halftime lead, but got run over by the Bulldogs in the second half. Now the Saints must concentrate on winning the MAAC conference tournament. An at large bid for the Saints is dicey at best. 8) Old Dominion - The Monarchs were thoroughly outplayed by the Panthers last Friday night. And for a good part of their next game at Georgia State, the Monarchs were trailing the Panthers. But a 13-2 run helped ODU escape Atlanta with a win. 9) Kent State - The Golden Flashes struggled but won over Western Carolina in their Bracketbuster game. Then Kent State avoided a letdown and won at Bowling Green. The last game of the regular season vs. Akron will be for the #1 seed in the MAC Tournament. 10) New Mexico State - The Aggies forced Pacific to play an uptempo game and the result was a very nice road win for NMSU. No Bracketbuster letdown for the Aggies as they trounced Idaho at home in their next game. 11) Murray State - Despite being hosed by ESPN on Bracketbuster weekend, the Racers still kept their focus and won a tough home game over an underrated Morgan State team. Unfortunately, they couldn't keep their Ohio Valley undefeated streak going and lost at second place Morehead State 70-65. Not a bad loss mind you. 12) Oakland - Did you know that the best team in the Summit League also has a very respectable RPI of 65, higher than Big East bubble teams Notre Dame and South Florida? The Golden Grizzlies have won 15 of their last 16 and have a 24 point win over Green Bay. 13) Tie Wofford and Sam Houston State - The best teams in the Southern and Southland Conferences deserve some love. After defeating former South Division co-leader Charleston, the Terriers have won nine in a row and 15 of their last 16. They have played a very tough non conference schedule - Kent State, Michigan State, Pittsburgh and Illinois. All were losses but no loss was more than 14 points, so the Terriers have been competitive. Meanwhile Sam Houston State has a RPI of 77 and only lost at Kentucky by 10 points. The Bearkats have won 13 of their last 14. Sam Houston State has an impressive average margin of victory of 10 points per game. As I said, if you want a migrane, then go read Michael Litos's CAA tiebreakers. Litos talked about how you have to read it four times. Hell, it just hurt my head reading it once, especially the tiebreakers for eighth! But one thing I did notice. I thought if W&M and VCU tied for fourth that W&M won the tiebreaker based on their record against the team above them, George Mason. It turns out the tiebreaker is based on their record against the first place team, which currently is ODU. Thus VCU has the tiebreaker, since they have at least one win vs. ODU (they play again at Constant on Saturday), while W&M lost both to ODU. So sorry I was wrong, But if it makes you feel better, I just read all of the CAA tiebreakers again for punishment. So for you Tribe fans, this is what you want. First a win at improving UNCW, which won't be easy. The Seahawks were winning for most of the game vs. Northeastern, played tough on the road against Radford, then went to Philly and knocked off Drexel. And the UNCW fans appear to be rallying behind interim coach Brooks Lee. Next Tribe fans, you want chalk. Yes, chalk. You want Northeastern to win at Mason and ODU to win at home vs. VCU. If W&M wins and Northeastern wins, the Tribe gets third no matter what VCU does based on tiebreakers. If only ODU wins, the Tribe gets fourth. Still an automatic bye. The only thing W&.., oh cmon Gar say it, Mary fans don't want to see is George Mason and VCU win. Then W&M is still tied with VCU and the Tribe finishes fifth. See what happens when you to lose at home to Towson. And thanks to Jerry Beach for linking to my recent article in his latest posting. Love the picture that starts his article. Bet that was Litos as he was writing his article. Litos, Beach and myself have all given up on the Haves and Have Nots in the CAA. It's a free for all now after Wednesday's action. 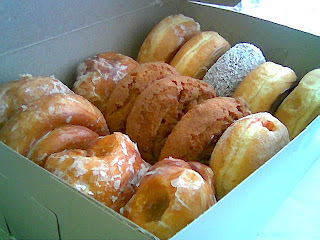 Be back later with the Mid Majors Baker's Dozen. I would like to thank the Evansville Purple Aces for delaying that sucker. Well, when I said in my previous article that the CAA Tournament got more interesting, I wasn't expecting what occurred last night. Two of the "Haves", Drexel and William and Mary both lost at home to "Have Nots". Drexel continued their second half swoon lost to UNCW in an uncharacteristically high score for 75-69 while Towson stunned the Tribe in Williamsburg 83-77. Johnny Wolf led the Seahawks with 16 points as UNCW had a season low eight turnovers. What made matters even worse for Dragons fans is that UNCW's top two scorers, Chad Tomko and John Fields didn't play due to injuries. It may also explain why the Seahawks had a season low in turnovers. Tomko and Fields combine for nearly six turnovers a game. Drexel has now lost four of its last five games. Chris Fouch led the Dragons with 15 points in his second game back from injury. Meanwhile at Williamsburg, Towson torched W&M for 50 percent shooting from the field in an 83-77 win. The Tigers scored 49 second half points on 57 percent shooting and shot 18 of 20 from the line. Troy Franklin led Towson with 27 points and was a perfect 10 for 10 from the charity stripe. Meanwhile the Tribe had a brutal night from the line, shooting 7 of 16. David Schneider led the Tribe with 22 points, but it was from the John Starks school of shooting, as he went 7 of 25 from the field, including, get this, 6 of 17 from beyond the arc. Geez. W&M fell into a fourth place tie with VCU. However, the Tribe currently have the tiebreaker on the Rams due to a better record against third place George Mason. But just to note, half of W&M's losses in conference are now to teams below .500. As a result of both these games and Hofstra's win over Northeastern, I am no longer talking about "Haves" and "Have Nots". It's open season as far as the CAA Tournament goes. And now the first round of the CAA tournament looks a little more lively. Can someone please tell Joe Lunardi to end Dayton fans suffering and knock them out of his 64 team selection in Bracketology? But I think the Owls just did that for him. Just when Flyers fanatics didn't think it could get any worse, Dayton scores a season low 41 points and loses at Temple 49-41. The Flyers have now lost three of their last four games and are now only 7-6 in conference. And I have such empathy for Dayton's fans. Whenever I watch them, I see this incredibly talented team with Chris Wright and Chris Johnson, and I ask myself how can they not be a Top 25 team. Well, a 4-7 record on the road is a good discussion starter. They have replaced Northeastern as my "Team Enigma". What was once considered a six bid league, is now down to at best four with the implosions of Dayton and Charlotte the past couple of weeks. Now if Rhode Island can just right the ship and keep it at four. Can we also have Lunardi stop talking about San Diego State? Currently one of Lunardi's last four out teams, the Aztecs got handled by the Cougars 82-68 at BYU last night. The Aztecs are now tied with UNLV for third place in a solid Mountain West conference at 9-5, and 20-8 overall with a solid 38 RPI. Sure, the record and RPI are pretty good. But upon closer look, San Diego State's non conference SOS is 122 and their best non conference win is over, um...uh...hmm...Arizona at home. Great. They lost to all their best non conference opponents - at Saint Mary's by 22, at Pacific and at Arizona State. And their two best conference wins over New Mexico and UNLV are at home. Sorry you can't put San Diego State in over Saint Mary's due to head to head and a better non conference SOS for the Gaels. Plus at least St Mary's has a signature road win over Utah State while San Diego State has..um...uh.. a home win over Arizona. Please, end the discussion now. Repeat after me. The Aztecs are not worthy. The Aztecs are not worthy. Finally, let's end on a good note. Kudos to the best team on Long Island, Stony Brook. Last night the Seawolves won the America East Regular Season Championship by holding onto beat Vermont 82-78. I was watching this game last night on MSG and Stony Brook looked really impressive for 33 minutes. The Seawolves were actually up 20, 66-46 with seven minutes left. Then a funny thing happened. Stony Brook went into a stall. And when you go into stall mode as Tieff would tell you, it's hard to get your offense together. And the Catamounts came back and made their next eight shots to cut the lead to five 71-66 with 2:25 left. Vermont actually got it down to three 77-74 with about 50 seconds left. Then Tommy Brenton scored his only points of the night to put the Seawolves back up by five 79-74 with 15 seconds left. Again Vermont cut it to three with 8 seconds left on two free throws but Stony Brook hit one of two free throws at the end to hold on and win 82-78. Stony Brook now has the #1 seed in the America East Tournament. This means that if the Seawolves win their quarterfinal and semifinal games in the America East Tournament at the University of Hartford, then they get to host the championship game March 13. It was also their 20th win on the season. A great accomplishment for a team that only won 20 games total from seasons 2005-06 through 2007-08. For basically the better part of two months, I have been talking about the "Haves" and "Have Nots" in the CAA. In fact, that was the title of my mideason review of the CAA. The "Haves" were the top six teams in the CAA that were all over .500 and the "Have Nots" were the bottom six that were under .500. The "Have Nots" at one time only had won five games as a whole vs. the haves. I also had my Midseason CAA Awards in that same article. I named Hofstra my "Most Disappointing Team." And they had won the award hands down. They started the overall season 7-3 and showed a lot of promise. Then the Pride lost nine of their next eleven games and stood at 2-7 in the CAA at the halfway point of the season. There was hope though, and I even named them runnerup to VCU as "Team Most Likely to Improve Second Half." This was due in large part to a much softer schedule than the brutal first half schedule the Pride had - where Hofstra played seven games against teams above .500 and lost all seven. Well a funny thing happened, Hofstra would win six of their next seven games in conference (and seven out of eight overall including the Bracketbuster win over Rider) to reach .500 at 8-8. As Mr. Beach so aptly put it, the Pride were "in uncharted territory" as far as a CAA team ever digging out of a five games below .500 hole. Now only one of these conference wins came against an above .500 CAA Team - a 75-64 win over Drexel. And Hofstra's one second half loss was at home, a twenty point drubbing to first place Northeastern 75-55. So the Pride stood at 8-8 last night again facing CAA co-leader Northeastern at Matthews Arena in Boston on ESPNU. Prime time. 9:00 PM. A chance to go above .500 and lay claim to no longer being a "Have Not" but a "Have" in the CAA. And yes Mr. Beach, I have Verizon FIOS, so I was able to watch the game from the comfort of my own bedroom. That's because the kids have control of the "Big TV", the 40 inch HD in the living room, till they go to sleep. My friend Mal texted me last night, asking me the prediction of this game. I said, and I quote "It's either a Northeastern crushing or a Hofstra win. Nothing between." And history is on my side as far as Hofstra- Northeastern at Matthews Arena. Below is the last four games Hofstra and Northeastern have played at Matthews since Northeastern joined the CAA. In the three losses, the average margin of Northeastern's victory was 16 points. I find it ironic that Hofstra's only win at Northeastern in those four games came was with its weakest team in the past four seasons, the 2007-08 team that went 12-18. I even told my friend Mal, please forgive me Jerry, that I was leaning to the crushing. Reason being, I couldn't see the Huskies losing on "Senior Night" with four of their best players graduating (Matt Janning, Manny Adako, Nkem Ojougboh and Baptiste Bataille). Plus Northeastern was coming off the very tough loss at home to Louisiana Tech. The Huskies were up by eight in the second half with five minutes left before eventually losing the game to the Bulldogs. So I thought Northeastern would be primed to want to beat Hofstra into submission. But that's why they play the game. The first half started off with both teams struggling to score. After three minutes, the game was tied at four. As the half progressed, as a result of good defense, both teams were turning the ball over a lot. Northeastern went out to a 15-9 lead on a layup by Nkem Ojougboh with nine and a half minutes left. It was the first of a few times in the first half where it looked like Northeastern was going to go out to a big lead. But Hofstra would answer each and every time. In this case, it was Halil Kanacevic with a layup to cut the lead to 15-11. It was the beginning of a mini 8-1 spurt capped by a Cornelius Vines three to put the Pride up 17-16. The Pride mini spurt was the beginning of a huge scoring run for both teams. The teams would combined to score double the number of points over the last nine and half a minutes than they did over the first eleven and a half minutes. At the end of the first half, Northeastern shot 50 percent while Hofstra shot 46 percent. The scoring leaders for both teams were not the usual suspects. Due to Greg Washington picking up two quick fouls early in the first half, Kanacevic played most of the half and was simply terrific with 10 points. He showed an array of post moves. Ojougboh matched Kanacevic with 10 and Adako had 8 points. What was unusual was the leading scorers for both teams were kept under wraps. Despite five assists, Charles Jenkins had more turnovers, six, then points, five at the half. Meanwhile Janning and Chaisson Allen combined for only eight points on nine field goal attempts. Tieff called me at halftime and we were reviewing the first half on the phone. We were impressed with Kanacevic and Vines. We were surprised on how Allen was kept in check, but we thought that might change. Finally, we agreed that Hofstra had to be happy to be only down two points with Jenkins having such a bad first half. Which leads us into the second half, which started like the first half. It took a minute and a half before the first basket was scored, courtesy of a Miklos Szabo layup. The game would be tied at four different times over the first six minutes of the second half. Hofstra would take its first lead of the second half, 45-43 on a Greg Washington with 14:11 left in the game. Hofstra then started pulling ahead as Jenkins was a second half offensive force. If it wasn't Jenkins assisting on a play or grabbing one of his eight rebounds, it was him nailing a three to give the Pride a 56-49 lead with 9:27 left. While Jenkins showed why he was named preseason co-CAA player of the year, Hofstra clamped down on Northeastern's offense. The Huskies could only manage four field goals in the first twelve minutes. Yet Northeastern would not go away on Senior Night. Allen hit a layup and hit the foul shot for a three point play to cut the Hofstra lead to 58-55 with 7:57 left. A Vines three put the Pride back up six, 61-55. But again, the Huskies rallied with a 6-0 run again capped by a short Allen jumper, while he was fouled, that tied the game. But he missed the free throw and the Huskies would score only one point the rest of the way. Jenkins immediately hit a jumper that would be the game winner to put Hofstra up 63-61 with 2:58 left. Jenkins would score eight of the last thirteen points the Pride would score. Hofstra had its best win of the season, defeating Northeastern 73-62. In the second half, Jenkins scored 15 points, which was as many as Allen and Janning had combined. Kanacevic added a double double with 16 points and 11 rebounds. Vines and Chaz Williams each had 12 as they combined to shoot 5 for 10 from beyond the arc. The Pride completely shut down the Huskies in the second half, limiting them to 7 of 28 shooting from the field. Janning and Adako combined to shoot 6 of 24 from the field. Allen was held to nine field goal attempts and only had two field goal attempts from beyond the arc, missing both. With the win, Hofstra is 9-8 in conference, 17-13 overall and has an excellent chance of finishing above .500 for the regular season in the CAA with a home game vs Georgia State on Saturday. Northeastern now is a game behind ODU for first place in the CAA. The Huskies travel to Fairfax to face George Mason on Saturday while ODU is home to VCU. And if Northeastern finishes second in the CAA, they face the strong possibility that their quarterfinal opponent very well could be the team that just beat them. - seventh seeded Hofstra. The CAA just got a whole lot more interesting. 1) Kansas - It's all about streaks. The Jayhawks have now won 12 straight games in a row, 57 straight home wins, 15 straight vs. Colorado and seven straight road games vs. Texas A&M. 2) Kentucky- Tough road wins vs. Mississippi State and Vanderbilt have matured its mostly freshmen starting lineup. 3) Syracuse - The Orange dominate Georgetown for over twenty-seven minutes. Then Syracuse holds on for dear life against the Hoyas and escape with a big road win. 4) Purdue - The Boilermakers huge road win vs. Ohio State makes them a number one seed now. 5) Duke -The Blue Devils get a much needed road win at Miami and sole possession of first place in the ACC. 6) Kansas State - A close home win vs. Nebraska. A fifteen point win at Oklahoma. The one constant between the two games, Denis Clemente. Twenty-one vs. Nebraska, twenty-seven vs. Oklahoma. 8) Villanova - Rough week for the Wildcats. Went from a one seed to now barely holding a two seed. The questions about Nova's lack of size are starting to surface. 9) Ohio State - Buckeyes bounce back from home loss to Purdue with big road win at Michigan State. In his last six games, Evan Turner has averaged 22 points, 10 rebounds and 6 assists. 10) Michigan State - The loss at home to Ohio State makes it two home losses in a row for the Spartans. Michigan State has now lost four of its last six games. 11) Georgetown - Hoyas showed a lot of heart cutting a twenty-three point lead down to two against the Cuse. But they fell short. 12) Butler - It's now seventeen straight wins for the Bulldogs. And the seventeenth featured a dominant second half performance vs. a good veteran Siena team. 13) New Mexico - The hard fought win over the Air Force gives the Lobos their eleventh straight win and New Mexico's best record ever through 28 games. The showdown vs. BYU Saturday is for first place in the Mountain West. 14) Temple - The Owls win two road games during the week, including surviving an upset bid against archrival Saint Joe's. Ramone Moore is the leading scorer in both wins for Temple. 15) Pittsburgh - Huge wins at Marquette then home to Villanova put the Panthers only one game behind Nova for second place in the Big East. 16) Vanderbilt - The Commodores won a tough road game at Ole Miss, and then gave the Wildcats everything they could handle. Click here for my Bracketbuster weekend review. Two teams separated by birth faced each other in a non-televised Bracketbuster game yesterday at the Mack Center. Both teams came into the game with a 15-13 overall record and an 8-8 conference record. Both teams had a dominant First Team Conference player - the Broncs' Ryan Thompson and the Pride's Charles Jenkins. And finally, thanks to the Hofstra Basketball Historian, Jerry Beach (and yes, Jerry, that should be your title), the teams came into the game with the all time series tied at seventeen games. So while we all try to figure out if Rider is really a dutch school, the Pride hosted the Broncs to see who would take the all time lead in the series (at least for one season, since the Bracketbusters agreement results in the teams facing each other the next season on the other team's home court). And of course, the two similar teams would end up playing overtime. It didn't seem that way when the game first started as Hofstra jumped out to a 13-4 lead thanks to two three pointers by Jenkins. But as only a good doppelganger would do, Rider came back with 13-2 run of their own, with Ryan Thompson only scoring two of those points, to lead 17-15 with 11:24 left in the first half. The teams would trade the lead several times over the next six minutes and the game would be tied at 29 with 5:13 left. However, the Pride would go on a 15-6 run to end the half as Jenkins, Greg Washington and Cornelius Vines would each end the half with 10 points a piece. Thompson would keep his team in the game with 13 first half points, which was only a sampler of what lied ahead the rest of the game. Washington in particular played a terrific first half with six rebounds and four blocks to go with his 10 points. But his play couldn't be described by the stats. He hustled his six foot 10 frame all over the place, tipping balls out on missed shots, hustling for loose balls and Washington seemed to be everywhere. So as the teams entered second half play with Hofstra up 44-35, you had a feeling the question of when, not how the Broncs would comeback on their doppelganger twin Pride. After the first six plus minutes, the Pride still led comfortably 53-42. But the strange fact was that none of the Pride's first half double digit scorers had a point yet in the second half. And Rider, led by none other than Thompson, seized upon that fact and started chipping at the lead. Jenkins would finally score his first basket of the second half to put the Pride back up by nine, 61-52 with 8:22 left. But neither Vines nor Washington had scored a second half point yet and the lack of balanced scoring started affecting the Pride. Again, the Broncs led by Thompson came back and a 12-5 Rider spurt cut the lead to two, 68-66 with 3:38 left. The Broncs would actually take the lead 69-68 on a Jhamar Youngblood layup with 2:50 left. The teams would change leads over the next minute and the Pride would take the lead on a layup by who else, Jenkins, 73-71 with 1:30 left. Jenkins had 15 second half points. Hofstra's lead would be 75-71 on two Nathaniel Lester foul shots. But Rider's scoring machine, Thompson would hit two of his own free throws to make the score 75-73 with 57 seconds left. But with 57 seconds left instead of trying for a two for one, the Pride, as they are warranted to do, ran the clock down and turned the ball over with no time left on the shot clock. Sigh. The Broncs called a timeout and setup a play. Thompson, who had 20 second half points, got the ball of the inbounds play and the rest of Rider cleared out for him. Thompson drove the lane and immediately kicked it to the open Novar Gadson for an easy two. Hofstra had a chance to win but again Hofstra ran the clock down and Jenkins missed a shot and we were on to overtime tied at 75. In overtime, it was the Jenkins and Lester show for the Pride as the two would score all but three of Hofstra's over time points. A jumper by Lester put the Pride up for good 79-77 with 3:23 left. The Pride would extend the lead to six, 87-81, on two Jenkins foul shots with 46 seconds left. But again, the doppelganger Broncs wouldn't go away and a Justin Robinson jumper cut the lead to one, 88-86 with 15 seconds left. But four free throws by Chaz Williams and Lester put the game away and the Pride came away with a 92-89 win. So while Beach ponders whether the doppelgangers should become permanently reunited in the MAAC (and he's not the first to say that. My friend Bob Sugar has been saying that for years), the fans got treated to awesome performances by Jenkins and Thompson. The junior Jenkins had 31 points. But it wasn't just Jenkins for Hofstra. Again, Washington had a terrific game with 12 points, 11 rebounds and 8 blocks. Lester came out of his season long fog with 14 points and 9 rebounds. And Chaz Williams added 12 points, 9 rebounds and 5 assists. The 6 foot 6 senior Thompson, whose brother is former Rider star and current NBA star Jason Thompson, had 38 points, 6 rebounds and 6 assists. Thompson had the crowd a buzz during and after the game. He has a NBA type physique and he can drive the lane, hit the three, rebound and dishes the ball really well. He is certainly coming to a NBA training camp near you this summer. The Pride now winners of seven of their last eight games travel to Northeastern before finishing their regular season at home vs. Georgia State. Rider has two home games vs. Siena and Canisius to end the regular season. Both teams play their conference tournaments the weekend of March 5-8. Only fitting for two teams separated at birth. Well it was an interesting weekend to say the least when it comes to the Bracketbusters. You saw one team, Butler, reinforce its position as a relatively high seed come tournament time. We also got to see another team, Northern Iowa clinch its at large bid, while showing the country on national television how good they really are, all while missing arguably it's best player. You had another team, Utah State, now make a serious case for an at large bid (don't forget, they beat BYU). Finally, you got to see what I thought was the strongest mid major conference, the CAA, stumble BIG time in four of the five games they played on national TV (and in general). I was 7-4 in my Bracketbuster picks, with all four losses as a result of picking CAA teams. Certainly not my best ever in prognostications, but it certainly is better than Beano Cook on a weekly basis. So without further ado, let's give out the 2010 Bracketbuster Awards. Best Team - Tie - Butler and Northern Iowa. Butler played an absolutely terrific second half against a Siena team, whose core veteran members have won a game in each of the past two NCAA Tournaments. And they did this while not getting much offensive production from Matt Howard (eight points) due to fouls. Meanwhile, Northern Iowa thoroughly dominated an Old Dominion team considered by many as an at large team. All while missing arguably its best player, Jordan Eglseder, due to a suspention. Both teams are not only locks for the Big Dance, but can definitely win their first round games. Team That Killed Its At Large Bid Hopes - William and Mary. Worst team is not the appropriate term for this award, because the Tribe certainly aren't a bad team. But the way the Tribe got beat down by Iona in their Friday night Bracketbuster game, it certainly ended their at large bid hopes. You can't be a bubble team and lose by sixteen points (and for those of us who watched it live or on TV it was 20 plus points in the second half) on national TV to a team with a RPI of 4o spots lower and expect the national committee to look the other way, even if you have wins over Wake, Maryland and Richmond. Just a bad loss. Most Surprising Team - Iona. The Gaels showed the country how much they have improved since Kevin Willard took over as head coach. The Gaels showed excellent ball movement and are very balanced. Liked the fact that their guards are able to drive the lane or hit the three (and it always helps to have a seven footer like Jonathan Huffman who can hit the three as well). If I was Siena coach Fran McCaffrey, I would be seriously concerned about the Gaels come MAAC Tournament time. Most Disappointing Team - Northeastern. Now this is no disservice to Louisiana Tech, who played a heck of a game and who I will give love to shortly, but this was a disappointing loss by the Huskies. When you are the co-leaders of the CAA and up by eight points with five minutes left on your home court, you have to win the game. Any talk of a possible at large bid evaporated just like that eight point lead. Gutsiest Performance by a Team - Louisiana Tech. I told you I would give the Bulldogs some love. This week La Tech traveled to Logan, Utah and lost a tough game to a very good Aggies team. Then they traveled back across country to Massachusetts to face the co-leaders of the CAA. And down eight points with five minutes left, the Bulldogs cowboyed up, shutdown two very good guards in Matt Janning and Chaisson Allen and held the Huskies to two points in the last five minutes. And all of this with their leading scorer, Kyle Gibson, only scoring nine points in the game. Impressive. Team That Put Itself Squarely on The Bubble in a Positive Way - Utah State. The Aggies thoroughly outplayed a good Wichita State team last night. The Aggies were up by as many as sixteen and the Shockers never got any closer than six points after the Aggies went up seven 20-13 with 8:11 left in the first half. Utah State had another very good night shooting from the field, hitting 51 percent of their shots. The Aggies now have a very respectable RPI of 35, a win over BYU and now the win over Wichita State to put on their resume. Team that Put Itself Squarely on the Bubble in a Negative Way - Tie - Old Dominion and Siena. The Monarchs put themselves on the bubble by getting solidly beaten by Northern Iowa. The Saints put themselves on the bubble after Butler dominated them in the second half. At least Old Dominion has the road win at Georgetown. But the Monarchs need to make the CAA Tournament final to strengthen their case. Siena has no such signature win. However, most of their team is responsible for the wins in each of the past two NCAA Tournaments is on this team that has a RPI of 31. The No Clue At All Tournament Committee says it doesn't take history into account. But that's bull. Arizona's long consecutive streak of making the tournament was definitely a factor in them making the Dance last season and no one can convince me otherwise (plus read this to get Joe Lunardi's take on Arizona being selected last season). Thankfully for the Saints, the MAAC Tournament is played on their home court, so hopefully it won't come down to Selection Sunday. Best Overall Conference in Televised Bracketbusters - WAC. The WAC won three of its four televised games, with the only loss being Nevada's two point loss at Missouri State. They won two impressive road games over conference leaders (La Tech over CAA's Northeastern and New Mexico State over Big West's Pacific) and Utah State thoroughly defeated the Valley's second best team, Wichita State. Best Overall Conference in Bracketbusters - Tie - America East and Missouri Valley. The America East went 3-0 on Bracketbuster Saturday with wins by Vermont, New Hampshire and Boston University. The Valley went 7-3 in its Bracketbuster games. Worst Conference in Bracketbusters - CAA. This one is not even close. The Colonial was 1-4 in televised Bracketbusters, with the lone win being VCU taking out Akron at the Siegel Center. It only got worse when you looked at the CAA's overall Bracketbuster performance. Colonial members were 3-9 overall as only Georgia State and Hofstra won along with VCU. The CAA certainly wasn't "Fun for the Crowd" this weekend. Best Performance in a Televised Brackebuster Game - Ali Farokhmanesh - Northern Iowa. Without Jordan Eglseder, the Panthers needed someone to step up. And Farokhmanesh stepped up big time. 23 points on five of nine shooting from beyond the arc. Best Performance in a Non Televised Bracketbuster Game - Ryan Thompson - Rider. Thompson had 38 points, 6 rebounds and 6 assists in the Broncs' loss to Hofstra. The 6 foot 6 senior's dominating performance against the Pride had the crowd a buzz during and after the game. And this is in the same game that had Charles Jenkins put up 31 points. Thompson can drive the lane, hit the three, dish the ball and is solidly built. Coming to a NBA training camp this summer. Most Disappointing Performance in a Televised Bracketbuster Game - Cam Long - George Mason. Brian Mull is right, Cam Long definitely is not worthy of a First Team All CAA Selection. Long, Mason's leading scorer, had a horrible shooting night for the Patriots, shooting 2 of 9 from the field and only 5 of 10 from the line. Long missing three free throws in the last five minutes probably killed Mason's comeback attempt against Charleston. Hofstra Up 92-86 with 5 seconds left. Good play calling by Rider.Bad play calling by Hofstra. And we have overtime. Greg Washington is playing a great game for Hofstra. But Ryan Thompson is keeping Rider in the game. Pride 65-58 with 6:03 left in the game. Pride up 53-48 with 11:10 left. Jenkins has not scored yet in the 2nd half for Hofstra. Hofstra up 44-35 at the half. Three Pride players in double figure scoring. Jenkins, Washington and Vines,each with 10. Ryan Thompson has 13 for Rider. Vines continues his hot shooting with his second three. Hofstra up 34-31 with 3:50 left first half. 15-14 with 11:37 left in the first half. Pecora not happy with Nate Lester. The Pride look to break the CAA's soon to be five game losing streak when they face the Broncs here. Northeastern blew a late eight point lead and lost to La Tech 70-67. Meanwhile Towson and Delaware are each getting hammered. Towson was actually down to Manhattan 20-0 in the first half. Not a good weekend for the CAA so far. Not at all. Having made my hotel reservations for the CAA Tournament earlier this week, I have been in anticipation mode. Anticipation mode for me is thinking about the CAA Tournament at least three times a day with the giddy expectations of a guy going on a date with his dream girl. Yes the CAA Tournament is like that for me. Now I have been to the CAA Tournament every season since 2002-03 with one exception, last season when my younger son had kidney surgery. Now part of what I am feeling may be due to the fact of having not been to the tournament in two years. I am already looking forward to the old haunts like Pasta Luna and Aunt Sarah's pancake house. Greeting an old worn down friend like the Richmond Coliseum. Getting to hear the best pep band in the CAA, James Madison. Getting to watch the most gorgeous kickline in the CAA, the VCU kickline. Wait, did I just say that? This season appears to be very special, unusually so. The last time I felt so eager with anticipation for the CAA Tournament was 2005-06, the pinnacle of CAA seasons. A good part of that was due in part to how good a season Hofstra was having . Though I try to remain neutral on this site, when you are a season ticket holder for the school you have been a part of since you were 18 and you have a good team very capable of winning the tournament, you can't help but get excited. Now the excitement for me this season is unlike 2005-06. My excitement is due to the fact that I think this might be the most competitive CAA tournament ever since that season. You have six teams capable of beating each other. And you have two teams, Old Dominion and William and Mary who have been in the at large discussion for much of this season. Strangely enough both teams played last night as part of the Bracketbusters. And I was traveling up to see the Mary as Tieff calls them take on Iona at the Hynes Athletic Center. Now it was a familiar drive as Tieff and I headed to the Hynes. If you are a regular reader to the site, you know I go often to Iona to see the Iona Lady Gaels, coached by Anthony Bozzella. So it was a little unusual to take the drive up to see the men's team play, though I have before. 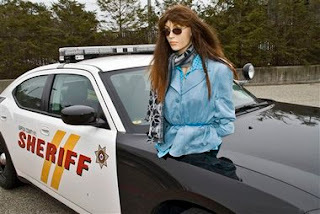 While we were on the LIE, Tieff, who was driving, turned to me and said "You know I decided to take advantage of the HOV lane with you as my mannequin. " So I put on a fake smile and bobbed my head like a mannequin might. Hey why not play along and at least I wasn't wearing sunglasses. Our plan was to get to Iona early, park, and hit a sports bar along the way to watch the Old Dominion - Northern Iowa game. A game I thought that Old Dominion would win especially with UNI's best player Jordan Eglseder being out due to suspension. Being the good passenger, I pulled out my cell phone and gave updates of that game to Tieff. And my start of the 30 second updates caught the Panthers on a run. A 9-8 lead quickly became 21-10. The Monarchs, one of the best scoring defenses in the country apparently couldn't keep UNI from scoring. So we got to Iona, parked in the back parking garage and walked back to the front entrance. We asked the security guard who had greeted us when we entered Iona where there was a sports bar with food. He directed us to The Beechmont Tavern cross the street. The Beechmont Tavern is located directly across from Iona on North Avenue. It's a pub/restaurant with a good number of TVs and very good Philly cheesesteak sandwiches. It's also adorned with a lot of pictures of Iona athletes. We noted two of Coach Bozzella's former players on that wall, Regan Pettijohn and Martina Weber. So we got there at halftime of the ODU-UNI game, each ordered a magnus cider and cheesesteak sandwich and proceeded to watch a good part of the second half. Thursday, I had predicted a game in the fifties. Well, as the second half got underway, with UNI leading 31-22, immediately I could tell I was dead wrong. In barely three minutes, the Monarchs and Panthers traded three 3 pointers and ODU cut the lead to 34-30 with 16:52 left. One of those threes was a non-called bank shot by Gerald Lee. It was Lee's sixth three pointer on the year on only nine attempts. Then came the killer play of the game. A Northern Iowa player drove the lane and kicked it out to the corner to Ali Farokhmanesh who squared up and buried a three. During this time Darius James raced out to contest the shot and in the process fouled Farokhmanesh. He sinks the free throw and bingo, four point play. But it got worse for James and ODU. Lucas O' Rear stole the ball from James and went in for a two point dunk shot. Panthers were now up ten, 40-30 and would never really look back. What was shocking was ODU, the third best team in the CAA in three point FG percentage defense at 29.5 percent, was consistently allowing open three pointers. Over the first seven and half minutes of the second half, Northern Iowa nailed five three pointers for a 49-35 lead. ODU would comeback with an 11-2 run to make it 51-46 with 9:24 left. But having a chance to cut the lead further, Lee missed the front end of a one and one free throw and Farokhmanesh hit another three, and the Monarchs would only get as close as six points the rest of the way. Northern Iowa went on to an impressive 71-62 win. Both teams had very similar FG percentages. ODU shot 23 of 49 while UNI shot 22 of 47, both nearly 47 percent. The difference is UNI was 10 of 22 from beyond the arc while ODU was 6 of 18. Farokhmanesh had 23 to lead all scorers while Lee had 19. We were in our seats at the Mulcahy Center before the ODU-UNI game ended. It was a very good crowd for an ESPNU contest, but not sold out. It was a very important game for both teams. First, both teams were going for their 20th win on the season. Considering the prior seasons both teams had, that was a significant accomplishment. Second, the Tribe wanted to show on national TV that their 51 RPI and wins over Wake Forest, Maryland and Richmond were not flukes. Iona wanted this game because they wanted to show the MAAC was not just Siena. Thus, you had the makings of a very good game on the U.
I had been looking forward to see how W&M would handle a small hostile gym. And a decent number of William and Mary fans made the drive from Williamsburg to see their Tribe go for their tenth road win. And it started out favorably for the W&M faithful as the Tribe tandem of David Schneider and Danny Sumner hit five of their first seven shots for a 13-9 lead with 14:38 left in the first half. The Mary would continue to lead 17-13 with 8:36 left when I - O - N - A Iona, as the fans would chant throughout the game, unleashed one hell of a run to end the first half. Alejo Rodriguez and Scott Machado would hit the next four baskets for the Gaels. Then Jonathan Huffman would bury a three (which would become a familiar sight as the game went along) and Jermel Jenkins would follow with a layup. Before you knew it, a 14-2 run would put Iona up 27-19. David Schneider would hit a three to temporarily stop the bleeding at 27-22. But Iona would finish on a 9-1 run to end the half, all on three pointers. The run was punctuated by Jenkins three pointer making it 36-23 at the half. Iona shot a stunning 64 percent from the field in the first half (the picture taken to the left was before the first half ended). Any Tribe faithful hoping for a Tribe comeback saw their hopes immediately dashed at the start of the second half. Before you blinked, Huffman and Machado combined to hit four three pointers and the lead swelled to 5o-26. The rout was on, much to the chagrin of the Tribe fans and to Tieff and I, who were hoping for a good game. And you could sense the panic on the Tribe. They got away from their backdoor cuts and ball movement and started hoisting three point attempts. W&M missed on their first four three point attempts. And to make matters worse, Schneider and Quinn McDowell, two excellent 80 percent free throw shooters, missed on three of their first four free throw attempts in the second half. In fact, later in the second half, Schneider missed really badly on both of his free throw attempts as they barely brushed the front rim. But give Iona a lot of credit, they played very very well. They contested most of the Tribe's shots and held W&M to 36 percent FG shooting and 28 percent from beyond the arc. McDowell, the Tribe's second leading scorer was held to four field goal attempts. Meanwhile, the Gaels shot 48 percent from the field and 43 percent from beyond the arc. It was a thorough beatdown as the Gaels won 69-53. Iona moved the ball around very well and got a lot of open looks for Huffman and Machado. Machado and Jenkins were much quicker than the Tribe guards and often drove the lane. Machado in fact made one sick layup in the first half where he went one way, the defender the other then drove by another for a scoop shot. Lots of oohs and aahs there. Kevin Willard has done a terrific job in his third season with the Gaels. He is the son of Ralph Willard, former coach for Western Kentucky, Pitt and Holy Cross, who is now the associate head coach for his good friend, Rick Pitino at Louisville. And Kevin was an assistant at Louisville before becoming the Iona head coach. In fact he brought Huffman with him. Willard is one of those coaches to watch, and I wouldn't be surprised if his name comes up for some soon to be coaching vacancies in April. As for the Mary, their night was very similar to the disappointing night for Old Dominion. They didn't defend the three well, and they allowed the crowd and Iona's 31-6 run over two halves to get them away from their game. I found that very surprising for a team that has won road games at Wake, Maryland and recently George Mason would have had such trouble. But Tieff and I along with 2609 people at the Hynes saw exactly that. With such a thorough loss on national TV, any hopes the Mary had of an at large bid crashed with a resounding thud. Now the Mary must squarely focus on their last two CAA regular season games and make sure to have a first round bye in the CAA Tournament. Their only hope now of ending their NCAA Tournamentless drought is to win the CAA Tournament. But I don't know if their loss was as bad as Old Dominion's. Old Dominion lost to a team that didn't even have its best player due to suspension. Their vaunted scoring defense gave up 16 more points than their season average. And they did not defend the three well at all. And finally, the number one rebounding team in the CAA got outrebounded. ODU is probably now squarely on the bubble. They probably need to make the CAA Tournament finals to give themselves a good chance of getting an at large bid. But winning the CAA tourney would be the best bet. But give UNI credit for playing such a terrific game without arguably their best player. They showed why they are a nationally ranked team. Farokhmanesh played an outstanding game. The Panthers outrebounded the best team in the CAA. They showed their vaunted scoring defense is legit. And with the win, Northern Iowa has DEFINITELY secured an at large bid....well as long as they make the Valley semis. The Panthers are a very very good team. I stated a few days ago that I thought the CAA was the best mid major conference. After last night's two beatdowns, I am not so sure. Northern Iowa made a strong case for the Valley and if Wichita State can pull off a very tough task, winning at Utah State, then I'll eat some crow and say the Valley is the best conference. Will the No Clue At All Listen For Once?